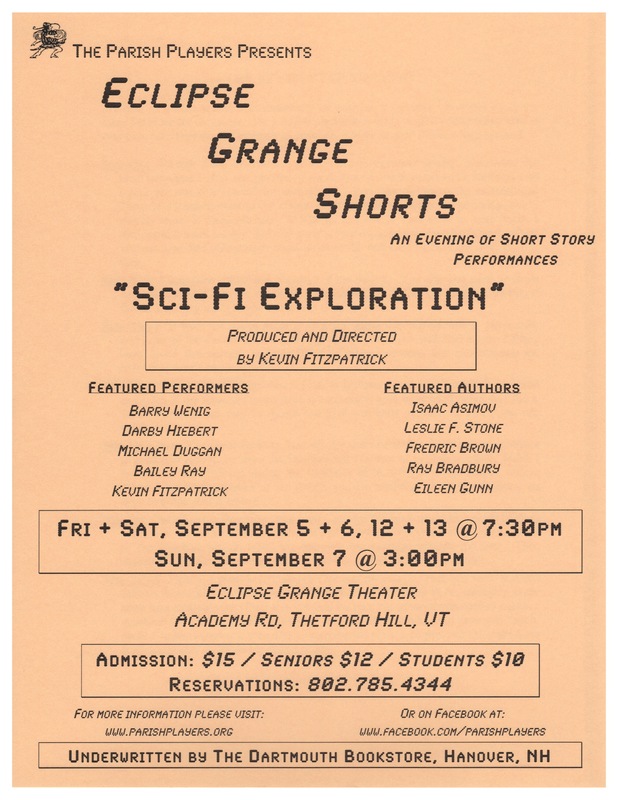 This is seriously cool: the Parish Players of Thetford Vermont are embarking on their 4th episode of their theater series Eclipse Grange Shorts. The theme this time around is adaptations of Science Fiction stories! The shorts will be held on September 5th and 6th at 7:30 pm, Septembed 7th at 3:00pm, and September 12th and 13th at 7:30pm. The play will be held at the Eclipse Grange Theater in Thetford. Tickets go for $15 for adults, $12 for seniors and $10 for students. Reservations can be made at 802-785-4344. What makes this cool is some of the authors involved: Asimov and Bradbury are largely household names, but it’s really exciting to see stories from early SF pioneers such as Leslie Stone, who doesn’t get a lot of press. It’s also really cool to see Frederic Brown and Eileen Gunn make the list. This looks like something that we’ll be heading out to see! Science Fiction author is coming to the Northshire Bookstore’s Saratoga NY branch later this fall on his tour to promote his upcoming novel, Lock In. He’ll be swinging through on Wednesday, September 17th at 7:00 PM. He’ll be signing copies and will likely do a bit of reading. It’s a bit of a drive for Vermont fans, but it should be worth it. I’m reading Lock In right now, and I’m enjoying it quite a bit. We’ll provide more information as we get it. In the meantime, read the first five chapters of Lock In here. There’s an accompanying novella, Unlocked, which is worth reading as well. 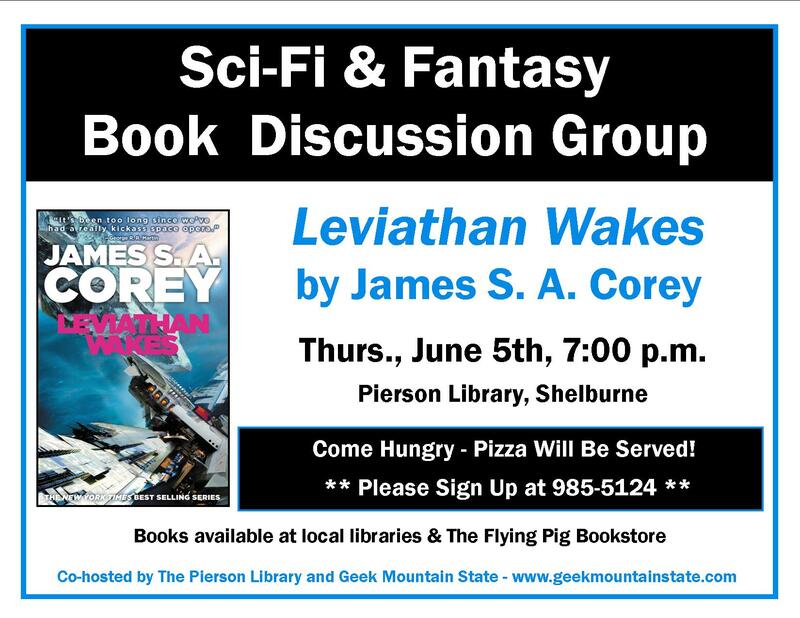 It’s always interesting to come across new names when it comes to Vermont and Science Fiction. Case in point, M.L. Humphrey. He’s published two books this year through Virgo eBooks: The Orphan from Space and A Whisker in Time. I am a Vermont native, husband, father, grandfather, Navy veteran, retired IBM engineer, retired printer repairman; a graduate of Goddard Jr. College, Vermont Technical College, and Trinity College. Over the years I’ve written technical articles, taught technical classes, and presented at technical conventions. I started reading science fiction in high school, and bought my first books through the TAB (Teen Age Book) club; they were “Journey to the Centre of the Earth” by Jules Verne, and “The Stars Are Ours” by Andre Norton. I’ve been reading science fiction for over 50 years now and have accumulated many great stories; along with a considerable amount of junk ones as well. I’d say by now that I probably have a good idea of what I consider a good story. I hope you enjoy them as well. Visit his author page here and you can ‘like’ him on Facebook. 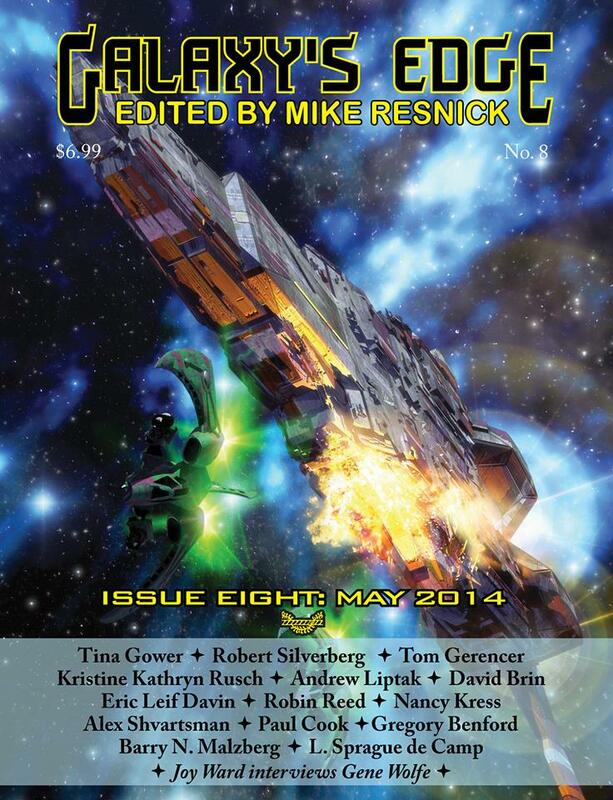 I just got the cover for this the other day: my short story, ‘Fragmented’ will be appearing in the May 2014 issue of Galaxy’s Edge Magazine, alongside such authors as Kristine Katheryn Rusch, David Brin, Nancy Kress and Robert Silverberg, among others. I wrote the story a couple of years ago, and last fall, gave it a real work-over before the inaugural VT SF Writer’s Series event with the Renegade Writer’s Collective. Stay tuned for details on the issue’s release, or subscribe here. Looking to build up your library, or do you need a good book to read? I’ve got Craigslist bookmarked on my phone, particularly the Books section for Vermont. It’s usually a pretty slow section, but every now and then, some interesting SF finds will come up, like this weekend. Set of 11 hardback fantasy books. Includes The Lord of the Rings trilogy, The Sword of Shannara trilogy, The Dark Elf trilogy, The Icewind Dale trilogy, and many more. All in excellent condition, no bent spines or torn pages. From a non smoking home. Orson Scott Card set. Complete Homecoming series, most of The Tales of Alvin Maker and 7 standalone books. All in great condition, most bindings unbent. Come check out our great selection of used Sci Fi Books. $1 each. Hundreds of titles available. Great condition. Hard to find.